One of the ways you can make your eco house as environmentally friendly as possible is to decorate it using natural eco materials. Whether it’s the type of glass, paint or wood varnish you use, there are plenty of eco materials you can use for smartening up your eco home and looking after the environment at the same time. Using eco materials is also beneficial for the construction industry because they’re easy and cheap to produce. Eco materials contain natural, rather than synthetic, substances, so they can be harvested over and over again. And because they’re also biodegradable they can be easily disposed of, rather than pollute the earth after being dumped in a landfill site. Eco glass generally comprises of 95% recycled glass and plastic, and can be used as a hard wearing surface for kitchen worktops. Eco glass worktops are available in a range of finishes to resemble marble, quartz or granite, and match conventional glass for practicality and style. Natural eco fabrics are the environmentally friendly alternative to synthetic cloth because they’re made from renewable plant fibres. The two most popular eco fabrics are cotton and jute (also called hessian), and other types include hemp, recycled polyester, organic leather, wool, felt and fair trade silks. 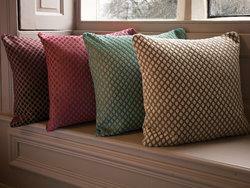 Eco fabric can be used for armchair coverings, carpets, curtains and rugs in your eco home. As well as being more environmentally friendly and biodegradable, eco fabrics are more breathable than synthetic cloth. Conventional lead based paint emits harmful chemicals into the air, such as pesticides, herbicides and toxins, which are referred to as volatile organic compounds (VOC). These chemicals are damaging to the environment and people’s health. In fact, conventional paint is blamed for causing asthma, chest complaints and sick building syndrome. Eco paints, on the other hand, contain fewer or no toxins at all, in which case they’re labelled as being VOC free. Eco paints are odourless and popular types are milk, plant, water or soy based, rather than lead. If anybody in your family suffers from asthma or other breathing problems then you should consider switching to using eco paint to decorate your eco home. When decorating wooden surfaces in your eco home, you should consider using varnish with a natural, rather than synthetic, resin. Conventional synthetic varnishes contain acrylic, vinyl and algid, which are environmentally damaging to manufacture and dispose of. Eco varnishes, however, contain a plant based resin. Popular types contain resin from dammar, copal and rosin trees. Eco varnishes are therefore more environmentally friendly to manufacture because the resin can be harvested over and over again, making them the green friendly eco material for protecting wooden surfaces in your eco home.